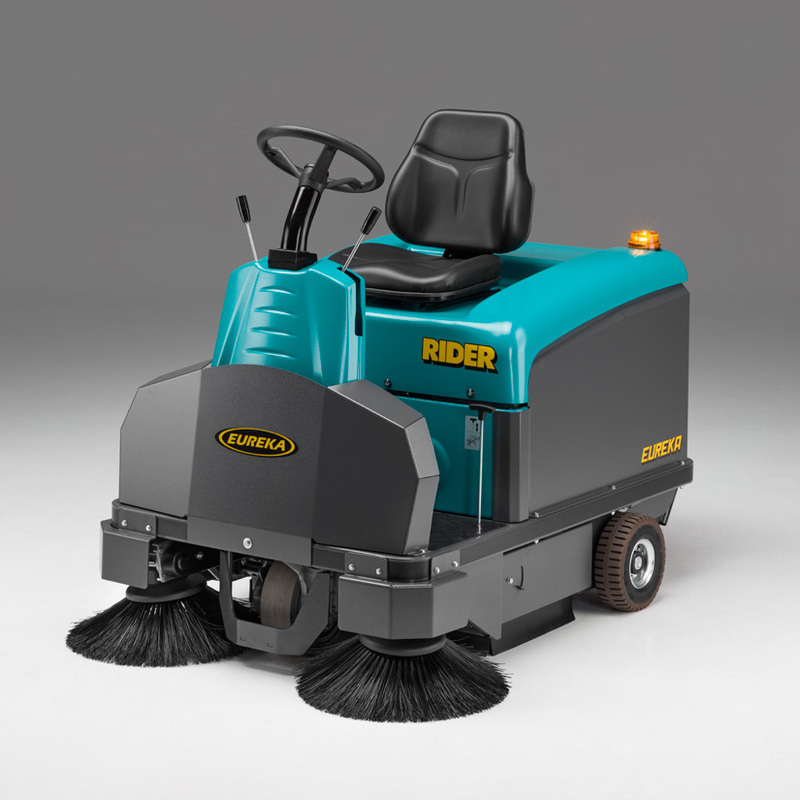 The Rider 1201 ride on sweeper is a combination of technology and ideas which enables all operators to keep large industrial and commercial areas perfectly clean, working in total comfort, quickly and at low cost. 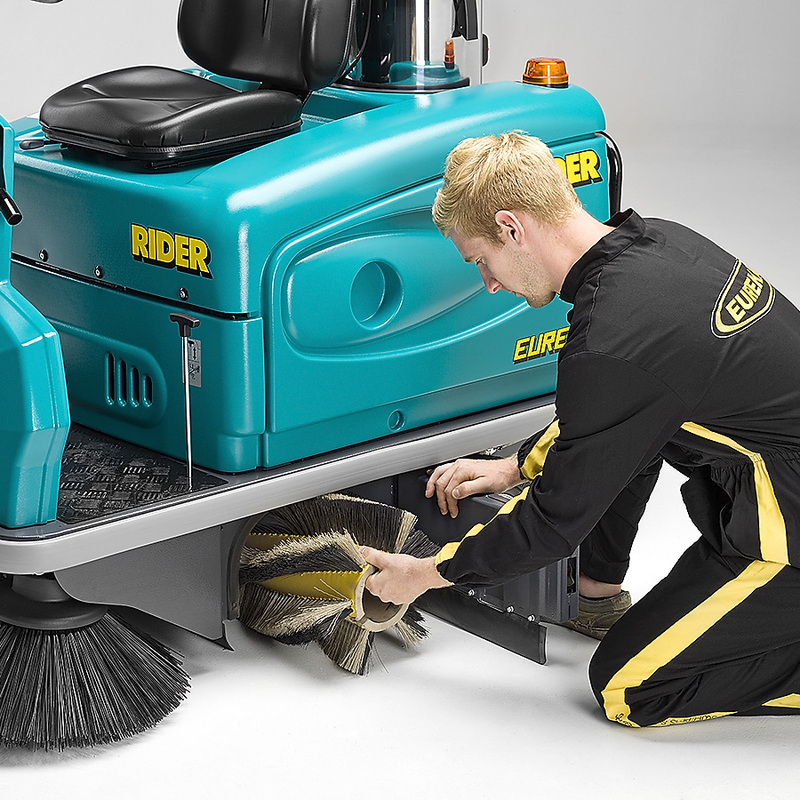 WHICH MODELS ARE AVAILABLE FOR RIDER 1201 SWEEPER? The Rider 1201 sweeper is available either SH (petrol Honda engine) or EB (battery) versions, offering high autonomy and top productivity. 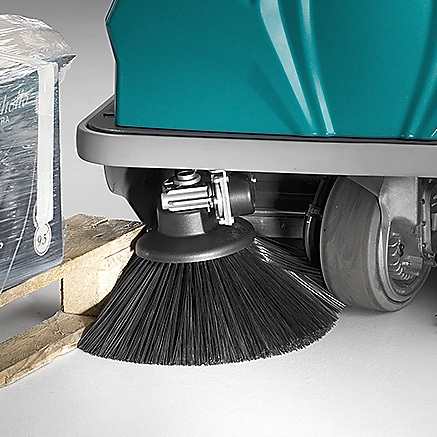 WHY IS RIDER 1201 SWEEPER ROBUST & RELIABLE? Rider 1201 structure is entirely manufactured in Eureka S.p.A, in order to ensure the highest qualitative standards. The durable steel frame is protected with epoxy paint and all tanks are made of special robust anti-shock ABS plastics. The Rider 1201 is fitted with a PVC bumper and three antiwear tires. The side brushes are set up on special anti-shock supports. The debris container made of metal is very robust and superior to traditional plastic hoppers. In addition there is a TotalSteel version of the Rider 1201, built to endure intense usage and tough environments. 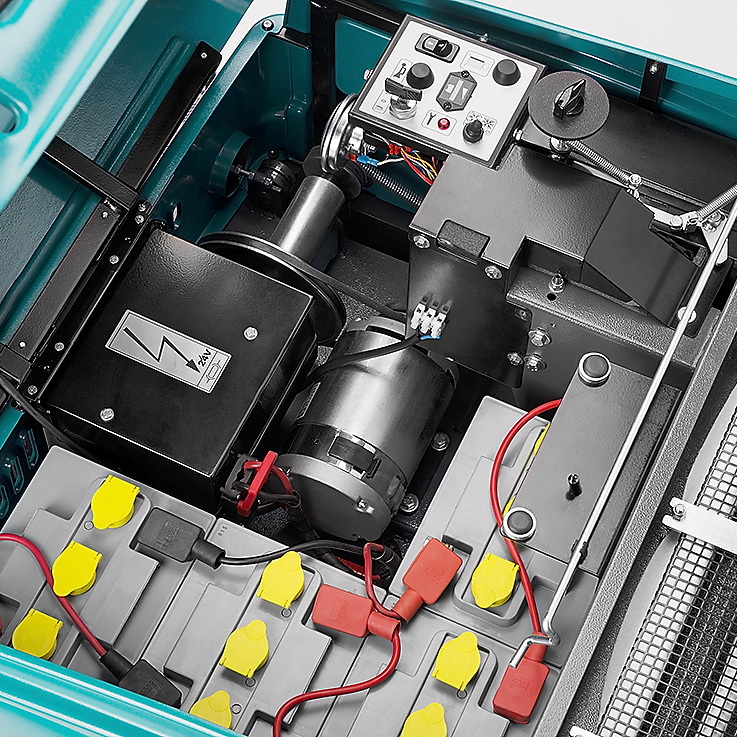 With enhanced bodywork in steel and a shock-proof bar to protect the drive motor, the machine is fully reinforced for maximum impact resistance. WHY IS RIDER 1201 SH HONDA ROBUST & RELIABLE? 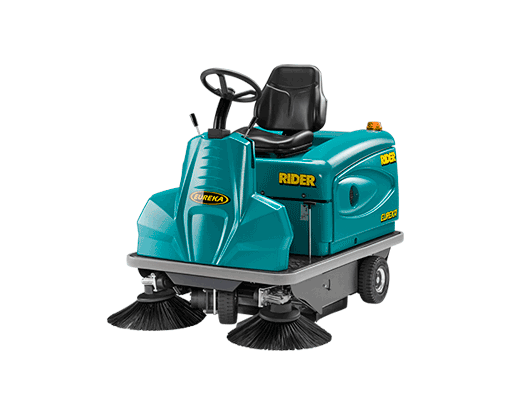 The Rider 1201 SH Honda is probably the most secure & reliable ride-on sweeper in the world. The powerful 6 cv Honda motor and the hydraulic water cooling system ensure the most reliable performance and a even longer endurance. The Rider 1201 SH is completely hydraulic for increased productivity and resistance. HOW TO CHANGE THE MAIN BRUSH? IS IT EASY? Rider 1201 has been specially designed for quick adjustment or replacment of the main brush without need of tools. WHY IS RIDER 1201 MANAGEABLE? The total visibility, the intuitive and ergonomic controls, the adjustable seat, combined with a compact structure enable easy cleaning of congested areas, you couldn’t clean before. HOW TO SWEEP UNDER TABLES, CHAIRS? The Rider 1201 is available with a special "on-board vacuum cleaner" which enables the cleaning of hard to access areas such as under the tables or chairs. HOW FAST IS RIDER 1201? Thanks to the powerful electric drive and high performance HONDA hydraulic motor, the Rider 1201 is able to reach a top speed of 8,45 km/h. HOW SILENT IS RIDER 1201 BATTERY POWERED? 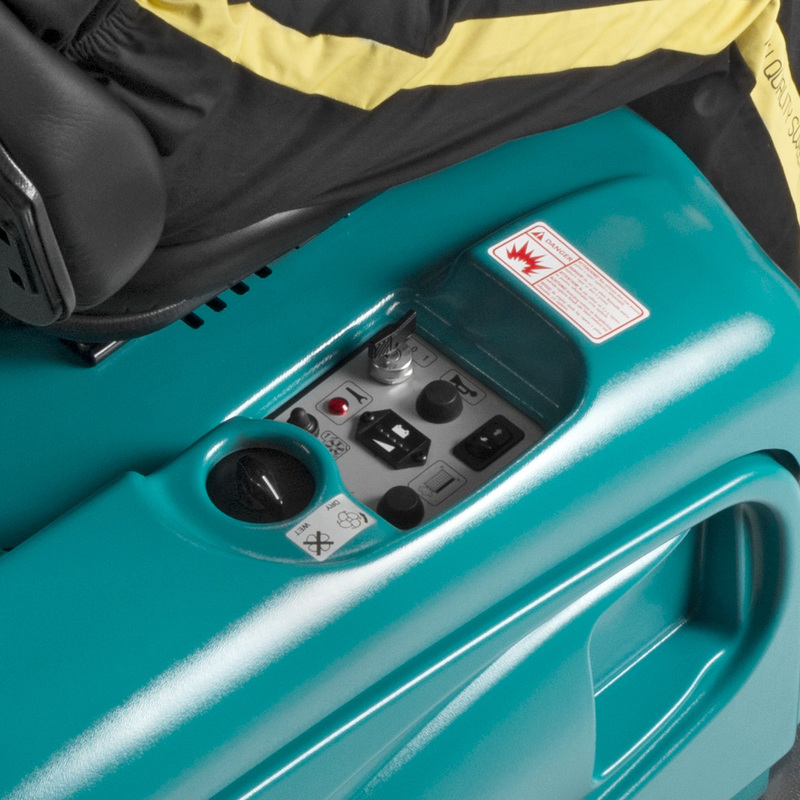 Rider 1201 battery powered is the most silent and powerful scrubber in its range. Thanks to the quiet electric drive motor which enables the Rider 1201 to work at a very low level of noise. This is important not only for the operator but also for all the other people around, meaning the Rider is well adapted to noise sensitive environments. The wide sweeping path (1.200 mm with 2 side brushes) combined with the fast operational speed delivers a large cleaning capacity, up to 10.140 m2/h. 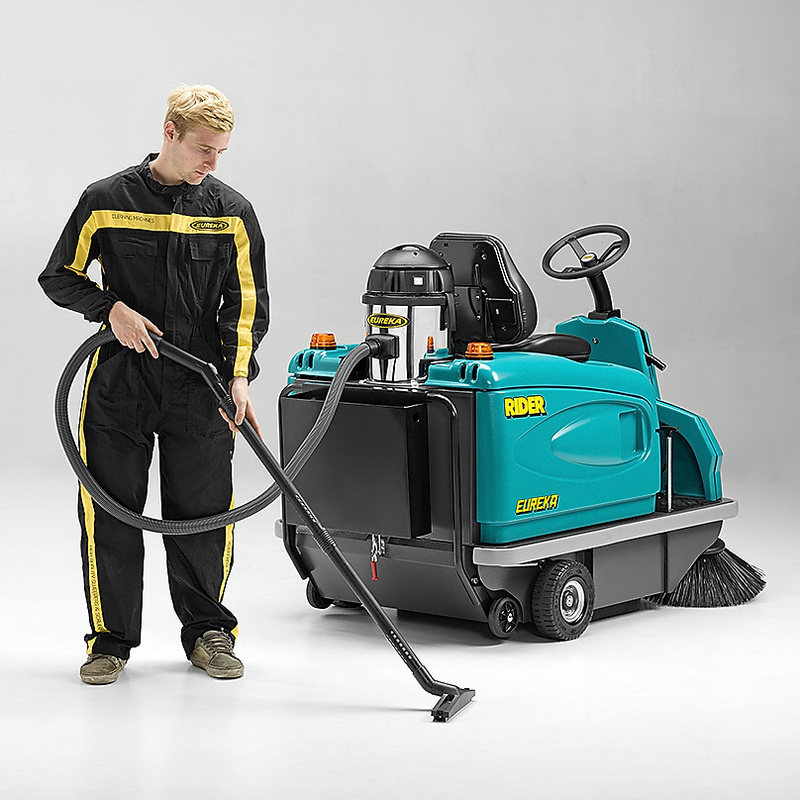 The compactness of this ride-on sweeper, with its small turning radius (1.000 mm), makes it particularly suitable for sweeping in narrow, confined areas not accessible by larger machines. The large filter area (4 m2) enables sweeping in the dustiest of environments. The Rider 1201 is at least 30 times faster than the swiftest labourer with a yard broom, and covers a full shift without the need for a tea break! Additionally, the Rider 1201 sweeps the floor more accurately and efficiently, controlling the dust that would be lifted by manual sweeping. Total visibility and easy entry/exit from both sides allow the operator effortless access to narrow spaces. The tough metal structure, combined with the epoxy-painted chassis, means additional protection against bumps, collisions, and better defense against scratches or rust. Designed to further enhance resistance to impact, a set of reinforced side hoods is available as optional accessory on the new Rider 1201. The reinforced steel panels make the Rider even more robust, in order to withstand the toughest operational conditions. All controls are simple and ergonomically located for easy operation. 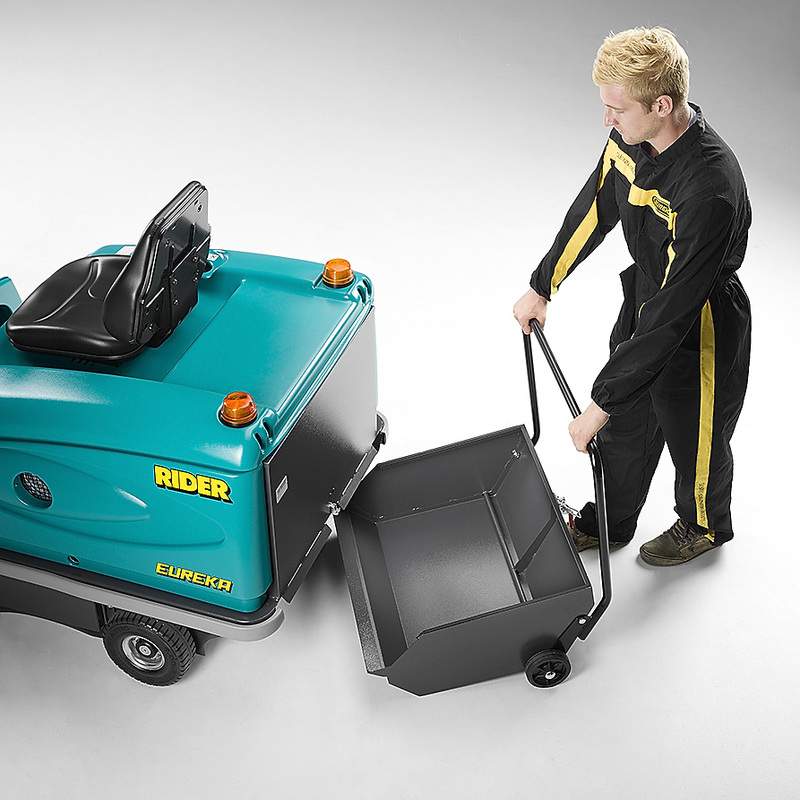 One single pedal controls forward and reverse speed; the levers to lower or raise the main and side brushes are located on the dashboard, as well as the filter-shaker control and the vacuum cut-off device, which can be engaged when sweeping on wet areas. A lifting flap is installed in front of the brush and easily opened from the driver’s seat. It allows the broom to pick up even bulkier debris. The retractable, anti-shock side brushes (AMSD system - a Eureka patent) enable the Rider 1201 to sweep effectively in confined areas. 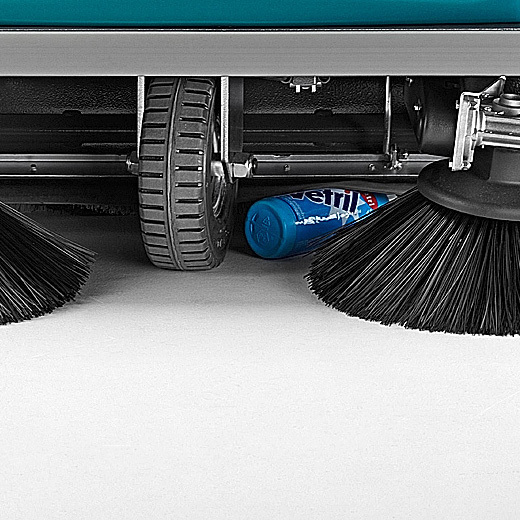 The floating, self-levelling main brush can be quickly adjusted or replaced without need of tools, and the retractable, anti-shock side brushes allow maximum cleaning efficiency on rough or uneven floors. The MultiBristle main brush, which has a width of 70 cm, includes a fine bristle section for fine dust, and a heavy bristle section for larger debris. The large, high-capacity (85 liters) debris container reduces down-time, increasing overall productivity, as the Rider 1201 can run for long periods without needing to be emptied. It is equipped with wheels and has a convenient transport handle that allows the entire hopper to be rolled to the emptying site. The Rider 1201 is equipped with an a polyester bag filter which is particularly efficient at retaining of fine dust, it is anti-static and washable, and has a much longer lasting life than other traditional ones. Operators are never exposed to dust while cleaning the filters. The battery operated version ensures a superior running time, for extra productivity. 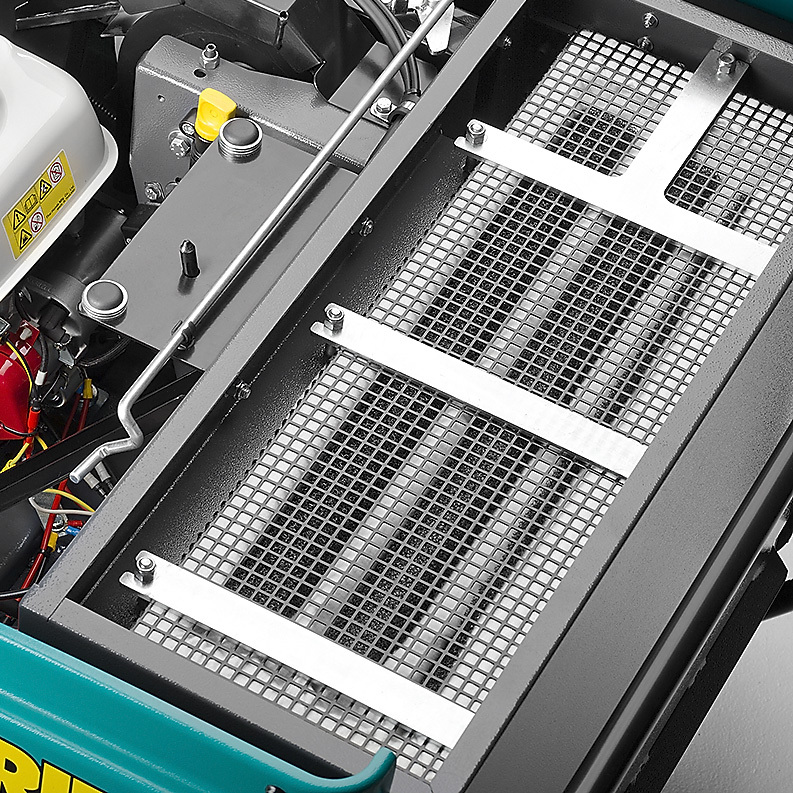 Maintenance access is convenient, the top lifts up to expose the engine, battery compartment, motors and other service areas. shopping malls, logistical depots, cleaning companies, and multi services.